In about 1113, the Norman Lord of Caerleon, Robert de Chandos, granted land at Goldcliff to the Abbey of Bec, near Rouen in France, for the founding of the Benedictine Priory of St Mary Magdalene. The priory was built on Goldcliff ‘island’, an area of high ground at the coast, and initially included around 200 acres of ‘moorland’ between Goldcliff and Nash. The land at this time was probably open salt-marsh and seasonal rough pasture, only suitable for grazing in the dry summer months, whereas it was regularly flooded by the incoming tide during the winter. To improve the land, the monks repaired and extended the sea wall along the coast towards the mouth of the River Usk, and built a network of ditches, or ‘reens’, to control water levels. Many of the reens followed existing streams and creeks, creating the characteristic pattern of irregularly shaped fields and winding lanes that can still be seen today. The monks may also have been responsible for building the Monksditch, the major reen down the western side of Whitson. By the end of the 13th century, the Priory held most of the higher coastal land in Nash and Goldcliff, along with large parts of the inland back-fen. It also owned profitable mills at Magor, Undy, St Brides and Milton, and valuable salmon fisheries, making it very wealthy. At this time, there were around 25 monks at the priory. Unusually, the monks at Goldcliff are recorded as wearing white habits; Benedictine monks usually wore black. The priory’s fortunes began to change for the worse when war broke out with France in 1295. Goldcliff was seen as an ‘alien’ priory (one attached to a foreign monastery) and became subject to regular demands for payment from the Crown. Further disasters followed in 1324, when storms caused serious flooding on the Levels, and 1351, when an outbreak of pestilence occurred. In 1334, the Prior Phillip Gopillarius was charged, along with several others, with stealing wine from a shipwreck off the coast at Goldcliff. In 1424, storms and serious flooding destroyed part of the priory building, including the parish church. The existing parish church at Goldcliff dates from around this time and may have been partly constructed with stone taken from the priory (parts of the building date to 12th century and it may originally have been a barn). By 1442 the priory had been suppressed and its assets granted first to Tewkesbury Abbey and then Eton College, which remained one of the largest landowners on the Levels until the 20th century. By 1467 the priory had ceased to exist. At its close, there were only eight monks left. There are few traces of the priory today, although aerial photographs from 2010 show what might be the foundations of priory buildings around Hill Farm. 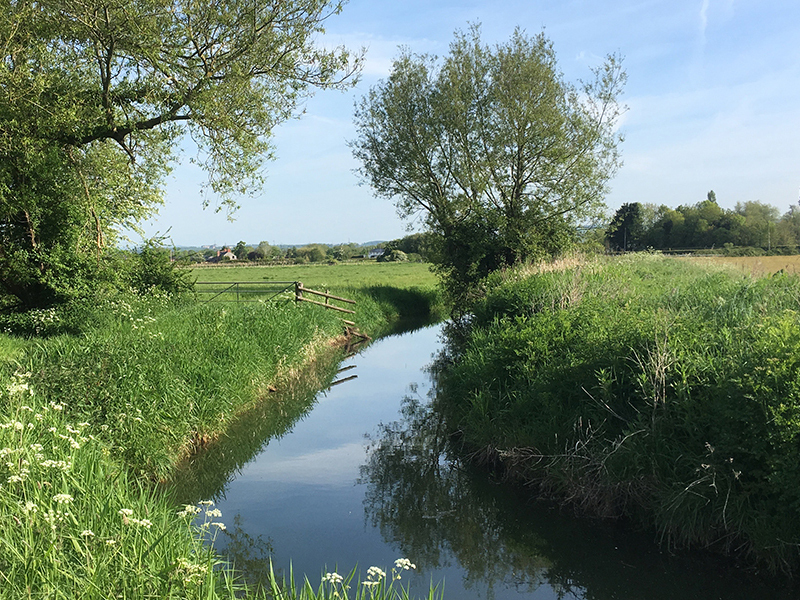 The lasting legacy of the priory lies in the landscape of the Levels around Goldcliff and Nash, which still follows the intricate pattern of field and ditches laid down by the monks over 600 years ago.